You won’t find a jetted bullet with all these features anywhere but here. 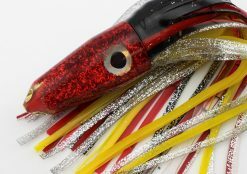 Our jet tubes get up to 22% more flow than any other lure on the market. 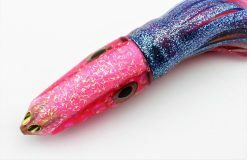 The bigger jet tube design is customized for our unique lures, working with the oval saddles and belly weight to maintain ballast. Our jets are positioned differently, sitting higher on the face so they can ‘breathe’ when the lure comes up for air. 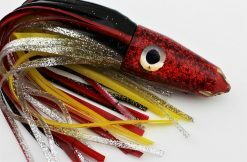 Yes, this really is a 4-jet belly weighted bullet! Heads weigh 4 ounces un-skirted. Run these everywhere, even the corners, on 130 – 300 lb leader. If you like bullets, you’ll LOVE the nice slow wobble action you get from a Jezebel. 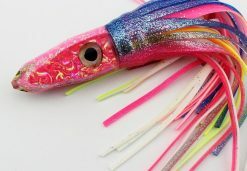 Marlin, tuna and wahoo love them too.